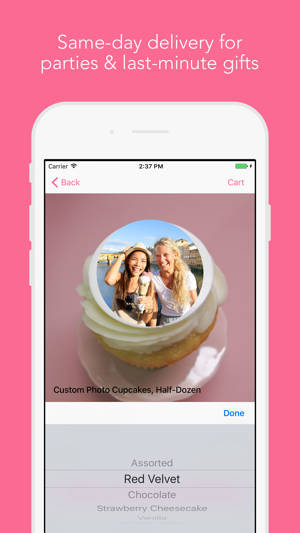 Photo cupcakes from Cako are a great new way to celebrate any occasion. Your photos and our delicious cupcakes make any party or gift personalized, memorable and fun. 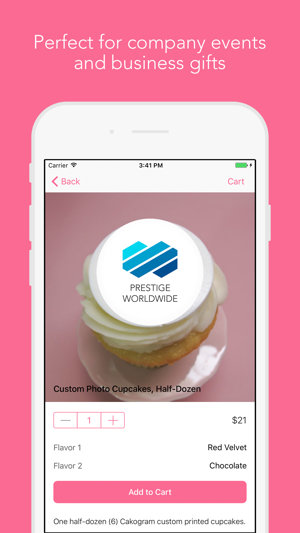 Use your favorite photos from your phone to design your own personalized custom cupcakes in seconds. Then, order directly from the app and get them delivered the same day, or pick them up in-store within minutes. Cako cupcakes and macarons are perfect for birthdays, holidays, anniversaries, office parties and other get-togethers. They also make a memorable gift - send them to a friend, family member, colleague or client with our convenient delivery service. -- Browse your favorite delicious Cako Bakery treats, including photo cupcakes, standard cupcakes, mini cupcakes and macaron gift box sets. 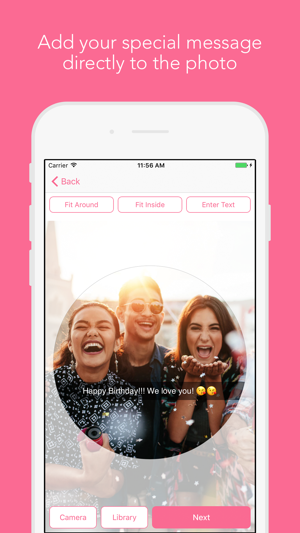 -- Choose a photo from your phone, or use your camera to capture a new moment just for this occasion. -- Use our built-in image editor to resize the photo for printing. Add a special message using the text feature if desired. 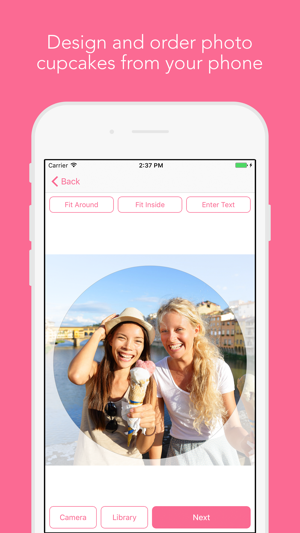 -- Preview your edited photo and select quantity and flavors. 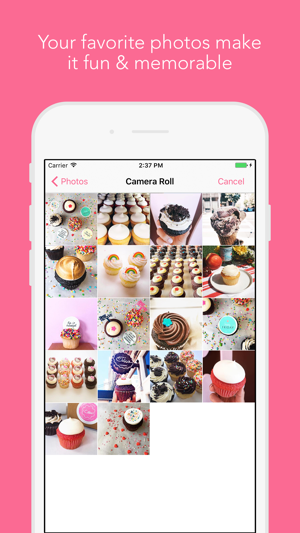 Photo cupcakes are available in quantities of 6 to 100+. -- Enter delivery or pickup information. Schedule your delivery or pickup for the same day, or choose a date in the future. -- Place your order with our secure checkout. We accept all major credit cards and Apple Pay. Currently available in San Francisco only. Confirm your delivery & pickup address in the app. Delivery fees and service charges apply.